We all want to keep our families safe. When it comes to hurricanes, tropical storms, wildfires, thunderstorms, flooding, tornadoes and other types of emergencies, the best way to accomplish that goal, and to protect property, is to be prepared. Your City and County governments can help you navigate disasters. Consider yourself our partner as together we prepare for local emergencies. We've teamed up to produce a Disaster Preparedness Guide to provide information for before, during and after an emergency. Please take a few minutes to read and consider this information, and to create an individualized plan specifically for your family. Educate yourself on the best way to respond to different types of emergencies. Develop a plan for evacuation. Make an emergency supply kit. Prep your home and yard for storms. Think through communications with family, consider pets, and identify potential transportation needs. Use a weather radio. Keep your important paperwork in a safe and secure place and store a backup copy in a safe deposit box, in the cloud or with relatives who live out of state. Be properly insured, and take pictures of your property and home each year. Sign up for the ALERTPalmCoast and Weather Warning emergency notification system. ALERTPalmCoast is a free service for all residents and local businesses. You will be automatically notified about emergencies that may impact your safety. 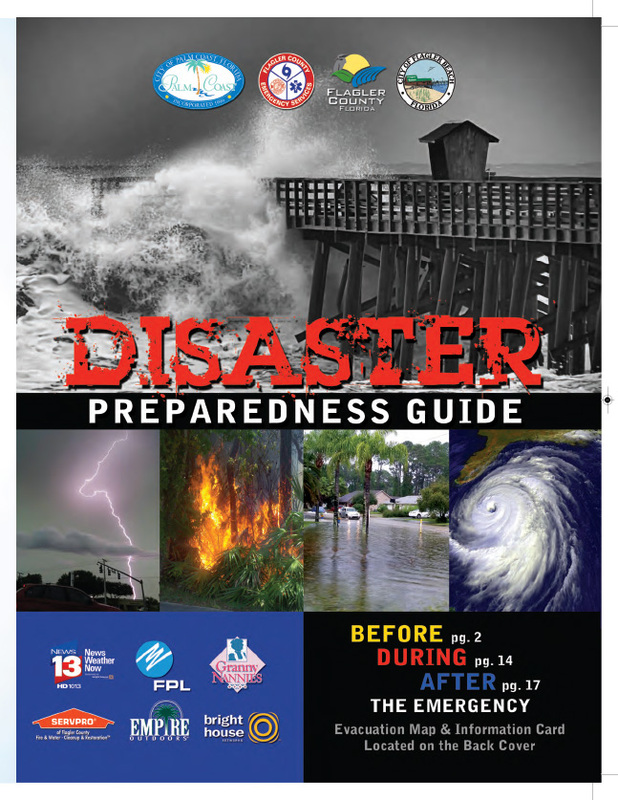 Pick up a hard copy of our Disaster Preparedness Guide and keep it in a convenient location so you can easily refer to its contents. It would be a good resource for you if you're evacuated, as well. Find a location to get one here.